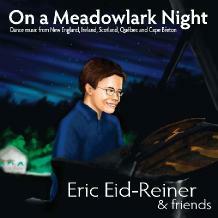 Eric's second CD, "On a Meadowlark Night" was released in April 2009! This CD of dance music from New England, Ireland, Scotland, Québec, and Cape Breton features Eric on piano along with Andy Reiner (fiddle, mandolin), Dave Reiner (fiddle), Ken Kolodner (hammered dulcimer), Kimberly Fraser (fiddle, feet), Anna Grosslein (flute), Billy Novick (clarinet), and Will Lydgate (bass). To find out about the CD release show at Club Passim in Cambridge, MA, on May 17, 2009, click here. Hot off the press -- read an article and an interview at Wheaton College on Eric and his new CD. From this CD, you are hearing Reel de Montréal, La Bastringue, and Old French, with Eric on piano, his brother Andy Reiner on fiddle, and his dad Dave Reiner on fiddle. Eric's CD "Grand Tour: Traditional Music on Piano" has been getting great reviews! Special guests are Dave Reiner, Andy Reiner, and Ed Berbaum. Find out more, hear a tune, see the tune list, and order Eric's CD here. Read about Eric and his music here in the Lexington Colonial Times. From Eric's On a Meadowlark Night CD, you are hearing Reel de Montréal, La Bastringue, and Old French, with Eric on piano, his brother Andy Reiner on fiddle, and his dad Dave Reiner on fiddle. Would you like to learn contra dance piano? Eric Eid-Reiner gives lessons both in the Boston area, in Western Massachusetts, and via Skype. Eric primarily works with students who have had a year or more of piano playing experience and are looking to branch out into the contra dance and folk accompaniment world. He’s also happy to work with students who may already have some exposure or experience in the New England, Irish, Scottish, Cape Breton, or French Canadian styles, and would like to work on ideas to incorporate into their playing, getting more comfortable performing, repertoire, melody playing, and more! Dancers and listening audiences alike have long enjoyed Eric’s innovative piano accompaniment, melody playing, and compositions. He can be heard performing throughout the Northeast solo, and with the Moving Violations, The Reiner Family Band, and fiddlers including Julie Metcalf, Alden Robinson, David Kaynor, and Andy Reiner. You can reach Eric at Eric.Eid.Reiner AT gmail DOT com.